I was six years old (my brother Ryan was only about 2 1/2) and my dad took us to our first concert. It was KISS. I was amazed what I saw not only on stage but also in the crowd, lets just say–I asked my dad why the girls didn’t have any shirts on… Maybe THAT is why they got a divorce? Before the entrance of the band the announcer says” You Wanted the Best. You Got the Best. The Hottest Band in the World–KISSSSSSSS!!!! While I cant remember if they said it way back then on the 1976-77 tour for their album Destroyer, I do know they have made an entrance to that for a long time. I have seen KISS 27 times in my 39 years. Do the math and you will see that some years I saw them more than once. 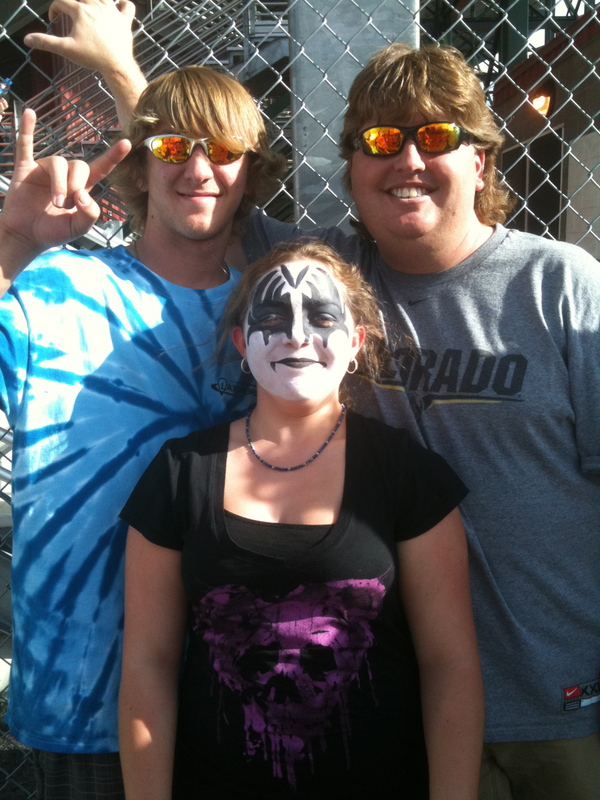 No, I didn’t travel ‘round the country following the band like some people did, namely the ‘Dead-heads’ but I have seen the ‘hottest’ band more than most people I am sure, including this past July when my two teenagers were baptized by a KISS show at the Cheyenne Frontier Days. What does this all do with me you may ask? Well friends and fans, I have modified the KISS tagline just a bit throughout my career as a canine trainer– by using We Have the Best and Train the Rest for our dog training centers. It aptly means that we have the best canine trainers in the world and we have trained many others how to be the best as well using our proven methods that has nothing to do with the fad of the day or the popular T.V. trainers that are making millions on selling T-shirts and videos and ironically becoming rock stars in their own right. Nothing against them. More power to them. In fact we receive a lot of business from clients that saw something on the tube Friday night and want to “fix” their dog using the techniques they saw on T.V. As of yesterday, September 17, 2010 Alaska will now see what it is to have some of the best trained dogs in the world. No folks, I am not tooting my own horn here… wait a second, I do think I am the best and I love to work with others in a friendly competition of dog training skills to see who can pass the mustard. You see, I don’t train dogs to just behave when company comes over and you are embarrassed when Max steals the turkey off the holiday table or jumps up on Aunt Mae in her Sunday best. I train dogs based on the natural instincts of a particular breed and what they were bred to perform. You will be amazed at how differently a German Shepherd respond to commands compared to a Labrador or a Husky. And no, I don’t condone or in fact even work with people that carry a dog in their purse. I call these canines [INSERT NAME HERE] (her last name is the name of a very famous hotel chain) dogs. I don’t dress dogs in costumes and don’t compete in Freestyle. That is just how I roll. There are many working dogs here in Alaska, namely with the best and fastest sled dog teams in the world. These are not the dogs I am talking about. In fact, most sled dogs have no idea what a loose leash (Heal) command is and you never discourage a sled dog from woofing down his food by making him sit politely while you feed him. Sled dogs are born and bred to do one thing–pull–and your average house dog has been so re-wired and over-bred that they could not do what nature originally planned for them before we brought them into our pack 20,000+ years ago. So Alaska if you want to have the best trained dog in the world give me a call at 907-841-1686 or send me an email at train@alaskadogworks.com and if you want more information click on the testimonials tab above to see what others are saying too.